Used Ford Mondeo Review - 2007-2014 | What Car? What's the used Ford Mondeo hatchback like? Large executive hatchbacks like the present-generation Ford Mondeo haven't had such a good time of it recently. The family car buyer has gravitated towards the trendy SUV of late, leaving just the business end of the market to snap up most of these cars, the majority of which are now seen only as motorway mile-munchers specifically for middle management to quarter the country in. 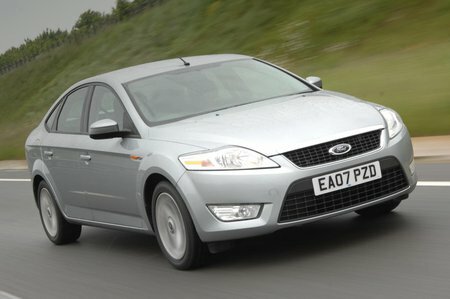 However, this third-generation Mondeo was always immensely popular among those who drove and owned them. It’s hard to fault the way it drives, for one, and it's spacious and practical, too, as well as being reasonably good value to buy and cheap to run. True, the engines aren’t as efficient as those in the Volkswagen Passat, but the diesels are still far from thirsty. Petrol engines from launch included a 1.6, a 2.0 and fast but thirsty 2.3 and 2.5-litre units. It is the diesels that are the most popular, though, whether in 1.8 or 2.0-litre form or the later 2.2-litre twin-turbo. Various new engines were added to the range throughout this Mondeo’s life, with significant additions being a 2.0-litre turbo petrol unit with up to 237bhp to replace the old 2.5 and, from the 2010 facelift, new turbocharged petrol and diesel engines of 1.6 litres. At the same time, Ford’s Powershift dual-clutch automatic gearbox was made available. There was a healthy range of trims on offer, too, ranging from entry-level Edge, through Zetec, which was notably well equipped, with alloy wheels, climate control and a heated windscreen among a whole host of goodies, past Ghia and up to Titanium and Titanium X, which are lavishly equipped but inevitably cost a little more on the used car forecourts. On the road, the naturally aspirated 1.6-litre petrol engines aren’t strong enough for a car of this size, and the 2.0-litre petrol is only just acceptable. The 2.3-litre petrol is rare and only comes with an automatic gearbox, while the turbocharged 2.5 is fast but thirsty. Instead, if you are going to buy a petrol Mondeo, the best option is the turbocharged 1.6-litre Ecoboost, which was introduced in 2010, at the same time as the Mondeo was given a mild facelift. Diesel Mondeos are much easier to find, although it’s best to avoid the 1.8-litre because it has a poor power delivery that makes it hard for you to build – or even maintain – speed without making lots of gearchanges. The 2011-on 1.6-litre is much better, as long as you’re not in too much of a hurry, but it’s the 2.0-litre diesel that’s most suited to the Mondeo, with good performance delivered in a smooth and quiet manner. The 2.2-litre diesel doesn't offer much extra in the way of performance, so it's not worth paying a premium for. Not only is it quiet and comfortable on the motorway, with whichever of those engines you choose, it’s great fun, too, with sharp steering and excellent composure in the bends. For a car of this type, it handles really well, with a balance unknown in other cars of similar size and age. The ride is comfortable, too, confirming that the engineers at Ford were at the top of their game when this particular car was on the market. The Mondeo is also very spacious inside, with loads of head and leg room for those in the front and the back. Meanwhile, a very large boot and split-folding rear seats add to the practicality. The limited rear visibility is more of a problem, particularly when parking, and, while the top of the dashboard looks smart and is pleasing to the touch, some of the lower panels feel distinctly cheap.